I call my Newborn Sessions 'Welcome To The World' because this is exactly how I feel about them. What an awesome opportunity and privilege I have to often capture the first photographs that are going to announce this baby to his/her world. My photographs will be treasured through generations of their family. One day they will show these images to their kids and their kids kids. Each and every Newborn Photography Session I capture is so very different. I absolutely love this. I enjoy the fact that no two photographs turn out the same. Babies have their own little (or sometimes big) personalities from day one and this reflects in my photographs and the running of the shoot. I want to capture the quirks and cute differences that make this baby themselves. Of course I approach each photography session with an overall plan but it is exactly that. Babies are unpredictable, especially when they are only a week or two old so we just have to go with the flow and roll with it, working around baby. I bring along a variety of props to your in-home session to give us options and variety. Each family has slightly different taste and preferences with colours and so on. This little baby boy was such a dream to photograph. Just check out that candid smile, you couldn't ask for cuter! His hair is simply insane. I absolutely love it! Within the newborn photography session I aim for 4 different set ups with different angles and aspects within each. We usually begin with the lovely white fur and then move into this ''bum up'' pose. As baby is kept naked for 90% of the shoot it is important that we crank up the heat to a toasty 85 degrees to keep them comfortable and asleep. This comfy basket is next on our agenda. I tend to find the babies love laying in these baskets full of fur. They could sleep there for hours! Whilst in these baskets I also try to capture lots of the small details that make your baby so unique, from their tiny hands and toes to the extravagant eyelashes and head of hair. These beautiful stretch knit wraps from @TinyTotPropShop are so soft. We bundle up baby for the final set up of the session. By this time it often works out that baby is starting to wake up and these swaddles help to keep them asleep for that final 10 minutes. Another reason we photograph the swaddled poses last is that it works best for the family and parent shots. Once I have captured them in the big wooden bowl we keep them in the wrap and begin the parent shots (if wanted). Although parent shots are not a ''must'' and some do not feel ready to have photographs taken of them just yet I think they are priceless. Babies grow so fast that the opportunity for these teeny tiny baby to daddy/mummy photographs pass by before you realize it. The parents shots are often some of my favourite and most treasured. Around 3 and a half hours later we are finished and the anticipation begins as you await the viewing of your finished images. At this point the second half of my job begins...Editing. I love this side of my job. The artistry I get to explore is so much fun. I am passionate about my end product being one that each family will cherish. So if you are looking for a photographer in the Toronto GTA to not just capture but create visual artwork of your new addition please get in touch. It is surprising to many that there is in fact a fairly small opportune time frame for photographing Newborns. Personally I try to book my babies in between 7 and 14 days as I find this works the best. If you wait for your baby to arrive before booking up you may find most photographers are fully booked. I receive many inquiries from families who wish to book in their precious newborn only to have to tell them that unfortunately a 1 month old is no longer classed as a 'Newborn' in photography terms. To achieve the incredibly cute, curled up photos we need a super sleepy baby. After the 14(ish) day window the babies tend to wake up for longer periods of time, sleep less deeply and become less mouldable. So tip #1 is to find your photographer well in advance and provisionally book in your session for around 1 week to 10 days after your due date and then move the session if necessary. My newborn sessions are booked for 10am. I ask all my mommies and daddies if at all possible to please try and keep baby awake for at least 1 hour prior to my arrival. This can require a fair bit of effort but is super helpful to the session. I tend to find that where this has been achieved the session runs smoother and we fly through multiple poses instead of having to get baby back to sleep between every shot. This is another great tip I tell all my families. Timing a feed to begin as I arrive sets us up beautifully for the session. It usually takes me around 15-20 minutes to set up all my equipment in their home. By holding off on a feed for at least 2 hours prior to the session and giving one right at the start helps us to work with a baby with a lovely full tummy from the offset. When you combine this with keeping baby awake we now have a content, very sleepy baby to work with = ideal situation. This is CRUCIAL! 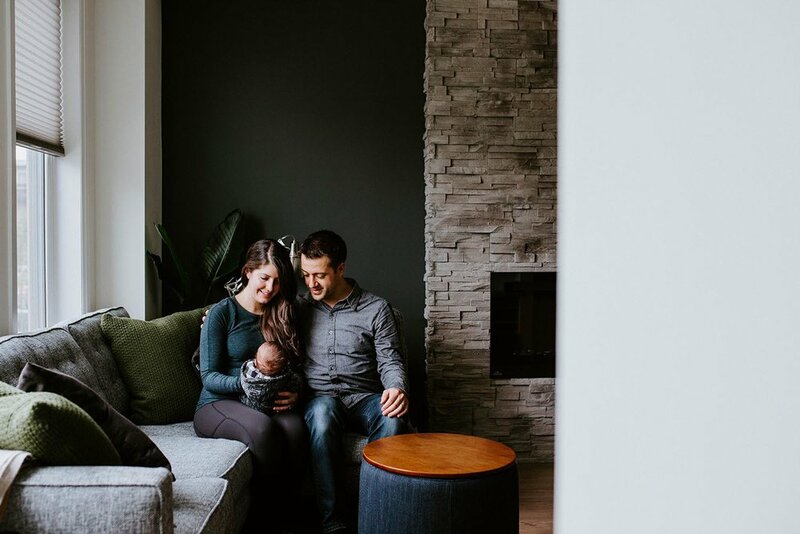 For the majority of the photo shoot the newborn baby is either naked or has very thin props on for clothing so we need to crank up the heat in your home to keep baby comfy and content. I tend to aim for a minimum of 26 celsius (80 fahrenheit) dependant on the time of year/type of room/home I'm working in. This temperature tends to make us sweat a little but works perfect for keeping baby happy and asleep. Milk is the wonderful drug of newborn photography lol. This is the miracle secret to a sleepy, happy baby. This is of course up to the parents completely however I always ask my mommies to be prepared to feed more frequently then normal just for this session time. As we move baby around somewhat and fiddle with tiny details sometimes baby wakes up and a cheat to get baby back into the session fast is a mini feed/top up. My sessions run for between 3.5 and 4 hours. In this time we may typically do an initial feed at the start and 2 top ups. Of course there are some babies who just sleep through the entire process no matter what but they are few and far between. As a mummy you care for your little one so much and it can be hard to trust the photographer with your precious baby. However it is critical that you do. Take your time when choosing your photographer and make sure they have lots of experience under their belt. I personally tend to find that babies take longer to settle when with mommy, especially if mommy is breastfeeding and smells of yummy milk. So after the feed I will (for the most part) steal baby away for cuddles and to get baby to sleep if not already there. I love to give the parents a lovely break and time to relax. I want them to be able to sit back, have cup of tea and enjoy watching the session. By taking charge of settling baby I get to know the little one and build trust with the parents. I want this experience to be an enjoyable memory for them, not one of stress and frustration. Now of course all of these are exactly as described...TIPS. They are just situations to attempt to generate/facilitate however we all know babies do not run on our schedule or do as we wish all the time so it is no problem if they are not acheived. This is why I schedule a lovely long 3.5 hours to cater for breaks, feedings and lots of cuddles to get baby back to sleep. I hope these tips will fill you with confidence and an idea of how you can prep/help out on the day of your little ones photography shoot. Getting pregnant is such a joyous occasion for so many but can be equally as terrifying and stressful. As the months go by and you feel as though you have been pregnant forever it is so important to remember what a special chapter in your life this is and forget the uncomfortableness that comes alongside all the bodily changes. In an era where we are bombarded with unrealistic, highly photoshopped magazine images of women, we also encounter this false representation in the media with regards to pregnancy and how pregnant bodies should look. We see all the celebrities who barely gain a pound, with zero stretch marks and shrink back to pre-pregnancy body within days of delivering their little one and feel like thats how we should be and that therefore we are somehow falling short. As a maternity photographer myself these images and self perceived expectations sadden me. I feel deeply that it is vital to empower women with the truth and embrace the natural beauty that comes with pregnancy. So much joy is stolen from so many with the negativity that comes with comparison. It disappoints me that we as pregnant women feel as though we have to compare ourselves to these magazine images. We need to get pregnant women everywhere, of all shapes and sizes, enjoying and excited about capturing their individual beauty in pregnancy and sharing it with the world. Going into my maternity sessions I give my all. It is my aim to leave these women feeling beautiful and comfortable in their pregnancy skin. I want them to fall in love with their photos and their stunning pregnant bodies. There is nothing more incredible then looking through the lens of my camera at an expectant mothers bump and realizing there is a mini human growing inside, it blows my mind every time! My sessions are so much about the bump and not hiding it but showing it off for all its beauty and being proud. Next I just love to capture the the excitement of the daddy and his love for this unborn bump. Often the men are dragged into these sessions and feel a little awkward to begin with but in no time I like to believe I have them surprising themselves and actually enjoying being a part of this special occasion. They find themselves suggesting ideas and props and getting so into the whole session. Its important to involve them and have them feel needed and special too at a time when all focus is generally on the mummy. I love how involving the dad often leads to revealing such deep love and connections with the mummy in this new adventure of their lives. I often think how lovely it will be for these children to one day look back as see the love they have for each other captured. Then of course its ALL about the women and celebrating the beauty and shape of this growing tummy. I absolutely love to get creative and plan ahead with my ladies what artistic looks they would love to go for. So much of the fun is in the planning as each couple is so individual. I never want to just recreate identical shots for every couple. It is always so incredible to hear how happy the mummy's are after they see all the edited images. Its as if they surprise themselves with how incredible they look when I see it from minute one. Enjoying the photo session is so vital, it should be a fun and comfortable experience that leaves you feeling encouraged and excited. So go ahead and celebrate your growing bump, wear the beautiful tummy hugging tops that show it off to the world. Embrace the change and empower each other to love every second!